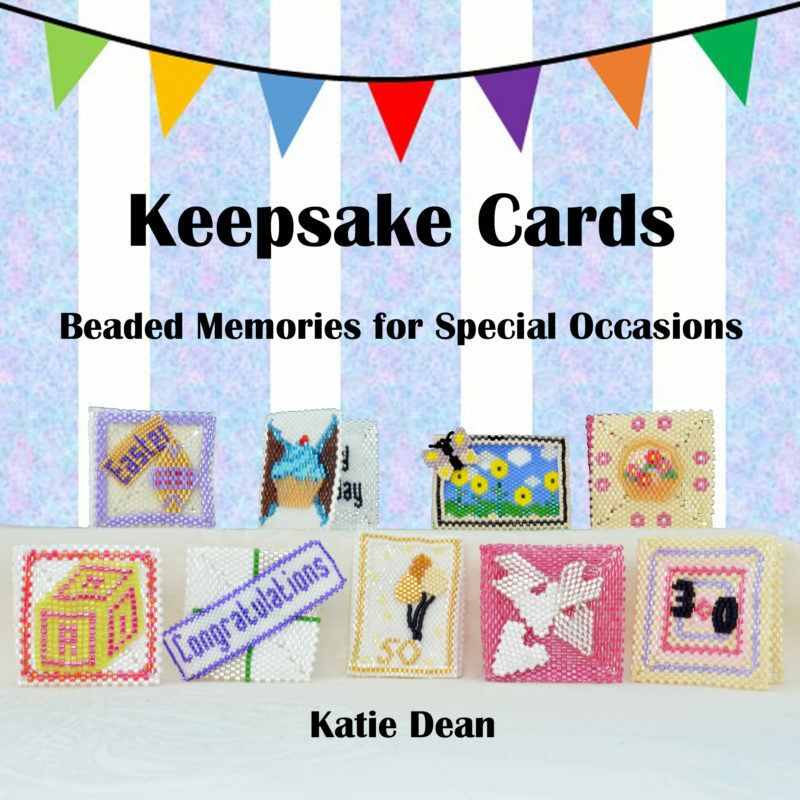 ‘Keepsake Cards’ was published in June 2016 and is a book full of projects and inspiration for making miniature beaded cards to celebrate special occasions. Katie takes you through the process of making miniature Keepsake cards in a series of chapters. You will start by learning how to make card blanks using Peyote stitch. These can be made in four designs. 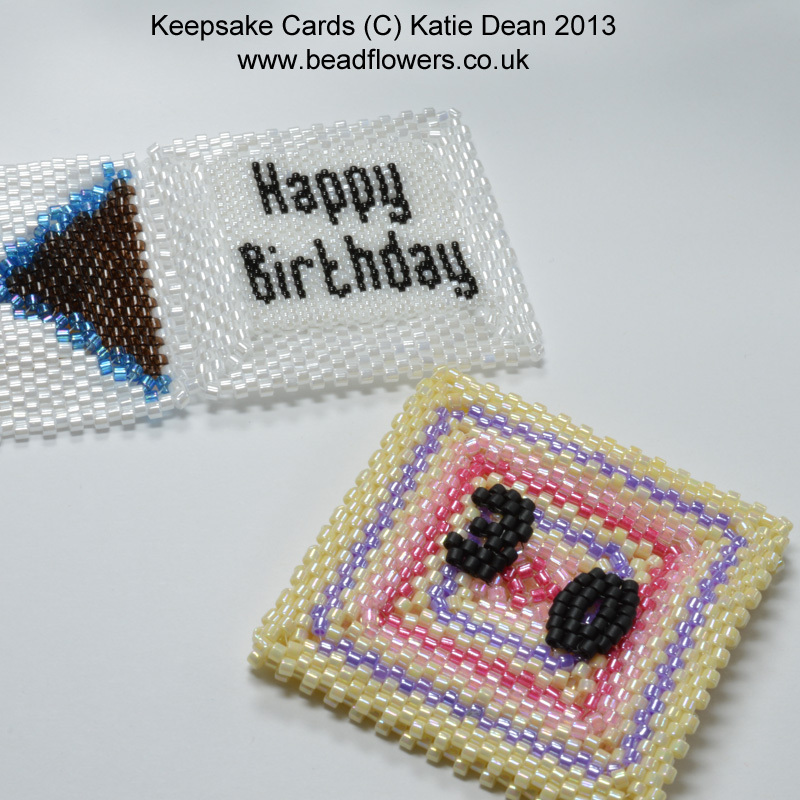 You will then learn how to make miniature beaded decorations for the front of your card. Finally, learn how to add greetings to the front or inside of your cards. In each chapter, Katie teaches you the basic principles and gives you a good range of ideas, then plenty of advice for creating your own personal designs. The book includes a basic alphabet and numbers in two different beading techniques so you can design your own greetings (blank pattern paper is also included). Having learned the principles of making your Keepsake cards, Katie has created nine complete designs for different occasions. You can personalise these by mixing and matching from the front designs, using your own colouring or mixing and matching the different greetings that Katie has designed for you. This book is a lot of fun: the instructions are clear with step-by-step diagrams. You will be using basic seed beads (Delicas and rocailles) and working in a range of basic bead-weaving techniques. The book assumes that you are familiar with the techniques, but it also offers links to free tutorials that you can download if you need a reminder or some extra tuition. If you enjoy making gifts for the important people in your life or you want to celebrate a special occasion, then this is the perfect project to do that. The book is available from Amazon (just follow the link below), or direct from Katie’s website – follow this link.